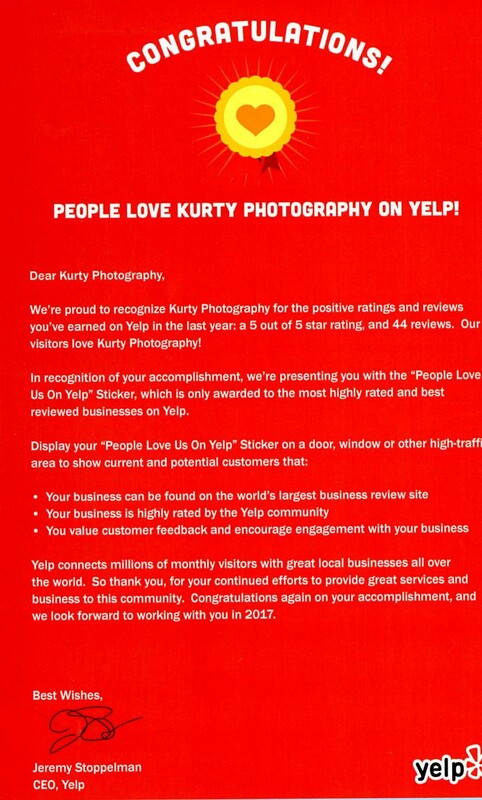 It's such an honor to receive the "People Love Kurty Photography" postcard from Yelp's CEO Jeremy Stoppleman, as the title is only awarded to the most highly rated and reviewed businesses on Yelp. In the social media era, Yelp is an important tool to search for business reputation and recommendation. The reviews on Yelp are real experiences and feedback from customers, and they reflect the level of customer satisfaction. Yelp is among one of the top tech companies started in San Francisco. I am also a frequent user of Yelp when I searched for a reliable car repair shop, doctors with good recommendations, and the food photos posted by avid foodies. Good businesses love Yelp, and businesses with poor products and services hate Yelp. What's so cool is that people get to be the judge.